There are so many in children that won’t have presents this holiday season—UNLESS YOU HELP!! 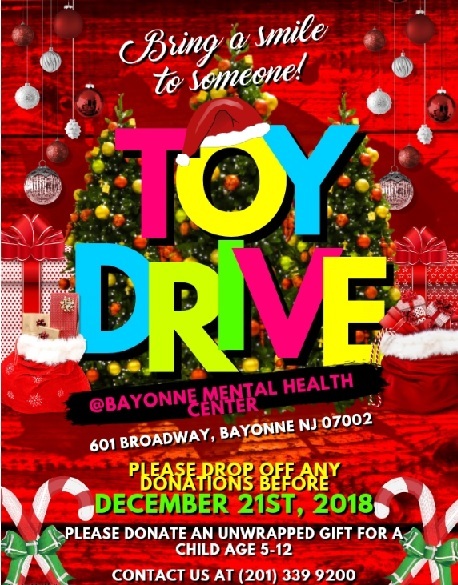 Please join the staff at the Bayonne Community Mental Health Center conduct its first ever Holiday Toy Drive. We are a small clinic in the heart of Bayonne that helps individuals develop their psychological and social strengths in order to improve personal and social functioning. As Christmas approaches, we ask that you remember the children we help at Bayonne Community Mental Health Center in your holiday plans. While preparing for joyous holiday celebrations with your loved ones, please consider donating a toy for a child age 5+ to our center. Please drop off any donations before December 21st, 2018. Please bring in an unwrapped toy for a child age 5-12. For any questions, please call 201-339-9200.